Chantal Beyer suffered injuries to her shoulder, lungs and ribs after being gored at the Aloe Ridge Hotel and Game Reserve, some 40km from Johannesburg. 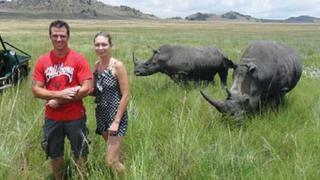 Ms Beyer, a student from West Rand, was with her husband and several other people on a game drive in the reserve. She is said to be in a serious but stable condition in hospital. South Africa is home to some three-quarters of the world's rhinoceros population of about 28,000 animals. But the country has seen a substantial rise in poaching in the past year amid a reported growing demand for rhino horn in parts of Asia where it is believed to have medicinal powers.